(Ages 8 years & up/Approx. 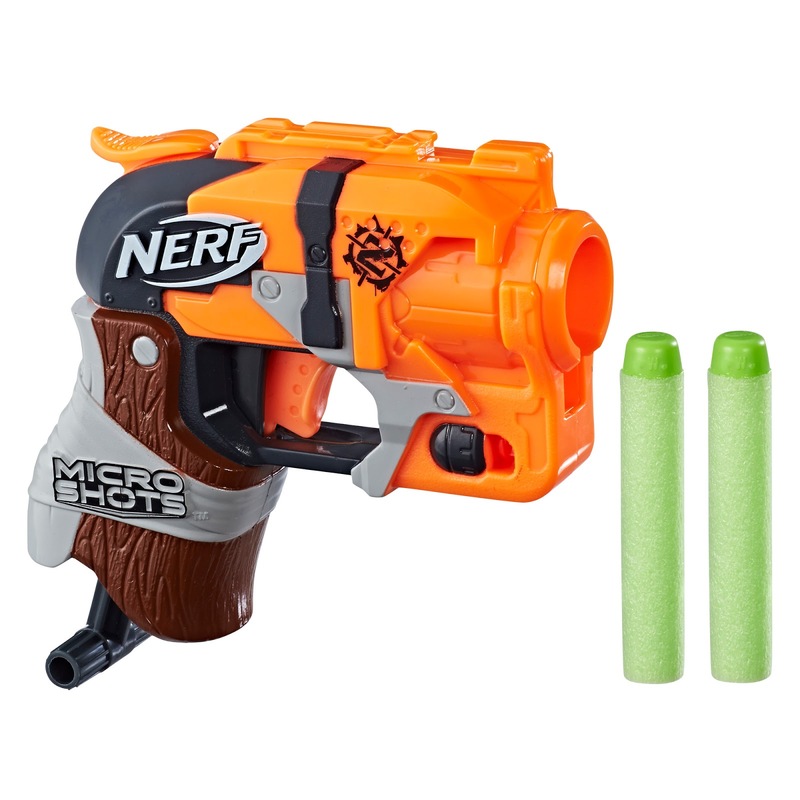 Retail Price: $99.99/Available: Fall 2018) Upgrade any NERF MODULUS blaster with the NERF MODULUS ULTIMATE CUSTOMIZER pack for the ultimate in Nerf Modulus blaster building and customization! 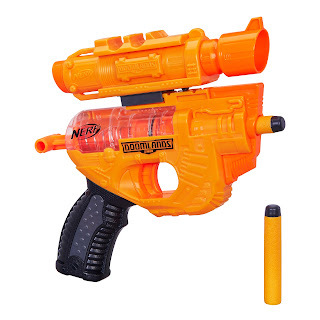 The motorized blaster comes with 7 tactical accessories to prepare for any mission or battle. The NERF MODULUS ULTIMATE CUSTOMIZER pack gives player the power to switch on the tactical light to illuminate targets for practice, power up the blaster’s motor with the acceleration button for rapid-fire dart blasting, focus their aim with the flip-up sight, and so much more. Package includes seven tactical accessories, two 10-dart banana clips, 40 darts, and four missiles. Available at most major toy retailers nationwide and HasbroToyShop.com. I really want to see this Reflective Targeting Kit in action. The part that intrigues me the most is the "Adjustable sight" that will "send a beam of light allowing players to perfect their accuracy skill." The release says this is designed to go on the Ghost Ops Evader. Nothing in there makes me think this won't work just the same on any unobstructed, forward-facing tac rail! (Ages 8 years & up/Approx. Retail Price: $14.99/Available: Fall 2018) Battlers can practice their skills day or night with the NERF MODULUS GHOST OPS REFLECTIVE TARGETING kit. The two Reflective targets feature LED lights, so no matter the time of day, targets are visible and ready for target practice! Attach the adjustable sight to the tactical rail of the NERF MODULUS GHOST OPS EVADER blaster, sold separately, to send a beam of light allowing players to perfect their accuracy skill. The REFLECTIVE TARGETING kit includes adjustable sight and two reflective targets; blaster sold separately. Requires two “AAA” alkaline batteries (not included). Available at most major toy retailers nationwide and on HasbroToyShop.com. Part of the new NERF ZOMBIE STRIKE SURVIVAL SYSTEM, the CHOPSTOCK attachment gives battlers a new way to strike back at the zombies! The CHOPSTOCK attachment doubles as a foam axe and stock attachment. Simply attach to any NERF blaster with compatible stock attachment point to use as a stock, or extend handle to use as an axe. Package includes foam axe stock. Available at most major toy retailers nationwide and on HasbroToyShop.com. Rip into action against the zombies with the NERF ZOMBIE STRIKE RIPCHAIN blaster! The 25-dart chain allows battlers to defend their turf against a zombie incursion. Fire one ZOMBIE STRIKE dart at a time, or slam-fire all 25 darts to swarm the targets. Load the darts onto the chain, place the chain on the blaster, then pump the handle to prime the blaster and pull the trigger to fire a dart. 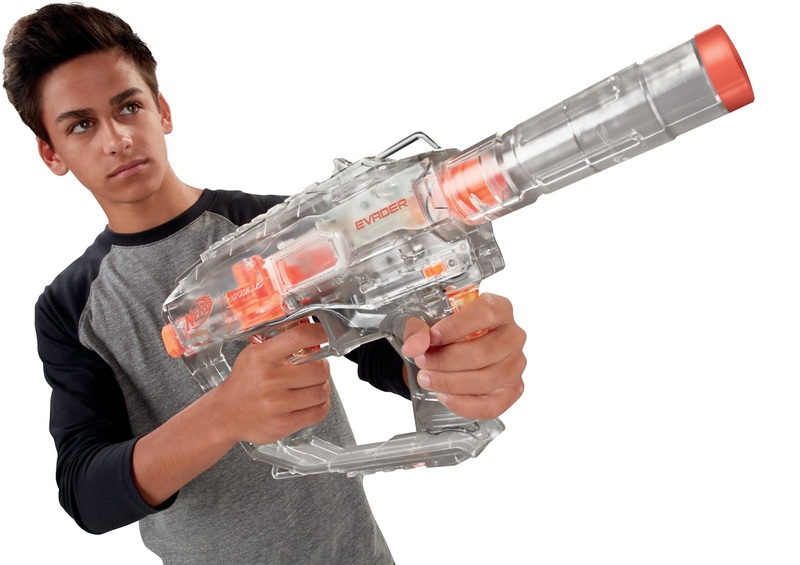 The NERF ZOMBIE STRIKE RIPCHAIN blaster is ready to take on any zombie, any time. Package includes blaster, dart chain, 25 ZOMBIE STRIKE ELITE darts, and instructions. Available at most major toy retailers nationwide and on HasbroToyShop.com. The Microshots are interesting. The more I look at them, the more I want them. I think they're a great for collecting. You can either get them all or just get the micro versions of your favorite blasters. 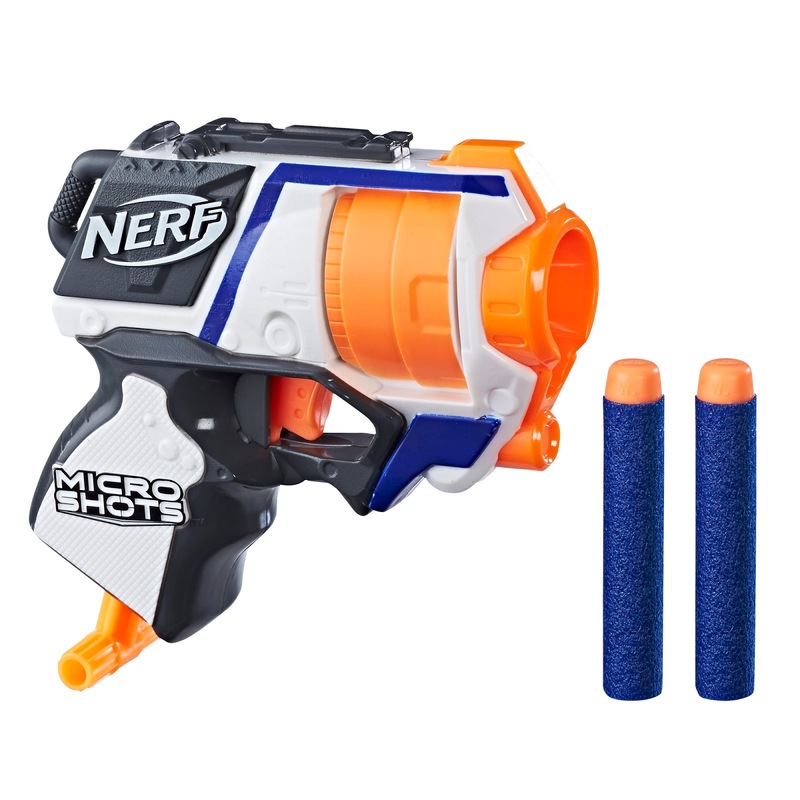 Battle opponents like never before with the NERF MICROSHOTS SERIES 2 Assortment! 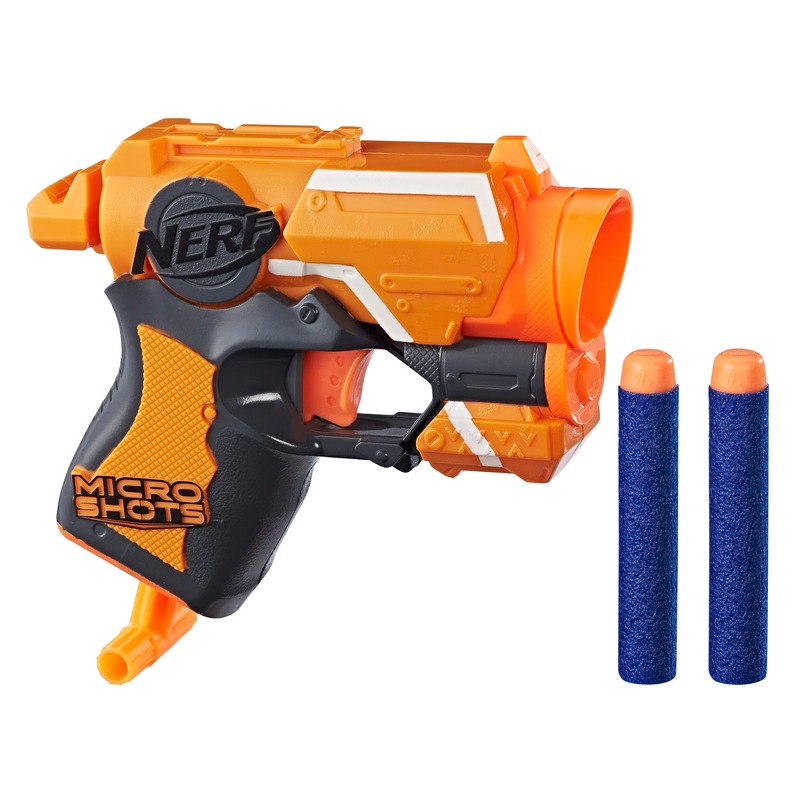 MICROSHOTS blasters capture the iconic look of the original NERF blasters fans know and love, but in a micro, super-deformed fun size. 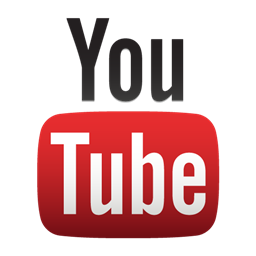 Simply load, prime, and pull the trigger for big fun in a small package. This one-shot blaster is as fun to collect as it is to blast! Series 2 includes one micro-sized version of the NERF N-STRIKE ELITE ROUGH CUT 4X4 blaster, NERF N-STRIKE ELITE STRYFE blaster, and NERF ZOMBIE STRIKE CROSSFIRE bow. Each package includes one blaster and two ELITE darts. Each sold separately. Available at most major toy retailers nationwide and on HasbroToyShop.com.